The white paper’s differential treatment of ‘low risk’ and ‘high risk’ nationalities, ‘high skilled’ and ‘low skilled’ people, will create new hierarchies of race and class – and intolerable hardship. 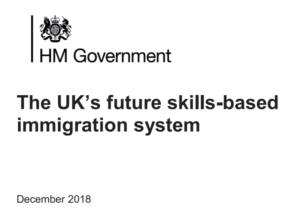 The white paper setting out the government’s post-Brexit immigration policy, The UK’s future skills-based immigration system, seeks to justify the removal of free movement rights of citizens of the European Economic Area (EEA) (1) by principles of fairness which dictate that all nationalities should be treated consistently. It would be a fine thing if such a fundamental principle of fairness were adhered to, and race, ethnicity and nationality were finally to become irrelevant in immigration policy. It is however a retrograde step to achieve equality by removing rights from those who have them, and subjecting all to the same dismal state of abject rightlessness. In fact, though, the proposals set out in the white paper do not achieve equality, or even seek it. They seek instead to entrench existing divisions based on nationality and class. The only change is that the dividing line is no longer ‘EU’ or ‘EEA’ vs ‘non-EEA’ or ‘third country national’, but instead, ‘low-risk’ vs ‘high-risk’ nationalities, who are to be treated differently in terms of ease of entry for visits, study and work in the UK, and ‘high-skilled’ vs ’low-skilled’ migrants, the former welcome, the latter not. EEA nationals will not need visas for visits or for short-term study, but will join other so-called ‘low-risk’ nationalities, from Argentina, Australia, Canada, Hong Kong, Japan, New Zealand, the United States and around ten other countries who can visit visa-free, with a multiple-entry electronic travel authorisation (ETA, similar to that required for British citizens visiting the US) before travelling. They will also be subject to fewer documentary checks than ‘high-risk’ nationalities when they apply for student visas. EEA citizens will also join a smaller group of ‘low-risk’ nationalities – from Australia, Canada, Japan, New Zealand, the United States, Singapore and South Korea – in being able to enter through e-gates instead of queuing to be seen by an immigration officer. ‘Low-risk’ nationals who are also highly skilled will be able to apply in-country to convert a visit into a work visa. The division of people into ‘low-risk’ and ‘high-risk’ nationalities does not merely legitimise nationality-based racial profiling, it is founded on it. As such, it is straightforward institutional racism in action. To be given an easier or harder time at the border, to be granted or denied particular opportunities – such as the possibility to convert a visit into a long-term stay for work – purely on the basis of nationality, is offensive in principle – but lawful. The white paper is a reminder that when race equality legislation was extended to public officials including police and immigration officers in 2000, an exemption permitted discrimination on the basis of nationality, ethnic or national origins in the operation of immigration controls, under ministerial authorisation, on evidence that a higher percentage of such nationals breached immigration laws. In the years after 2000, the exemption was used to discriminate against various groups including Afghans, Albanians, Chinese, Kurds, Roma and Tamils, and asylum seekers claiming to be Somali, Eritrean, Afghan, Palestinian or Kuwaiti, by subjecting them to more intensive questioning and sometimes language analysis, and requiring more documentary evidence to support their application. More recently, ministers have not specified the nationalities to be discriminated against. in the authorisations, although they are believed to include Pakistani students and asylum seekers claiming Syrian nationality. The white paper suggests that ‘low-risk’ status may in future be awarded to nationals of countries with which the UK secures trade deals, exposing the status as a commodity, which has nothing to do with any assessment of risk. This ties in with the basic policy set out in the white paper, which is the narrow and nativist principle that only those migrants who bring a clear economic benefit to Britain will be welcomed. That means business people and investors, those coming to work in the UK with skills and qualifications gained at another country’s expense, or those paying vast sums for the privilege of studying here. To attract as many skilled workers as possible, the cap on numbers of skilled workers, imposed by Theresa May as home secretary in 2010, will be lifted, the threshold of qualifications lowered (to the equivalent of ‘A’ levels), and employers will not need to advertise most jobs in the UK before seeking to recruit from abroad. Applications for work visas from skilled and highly skilled migrants with a sponsoring employer and a minimum salary of £30,000 – which is more than most teachers and many nurses earn (the level is subject to consultation) – will, the white paper claims, be processed within two to three weeks. (Compare this with the years that many destitute asylum seekers are forced to wait for their claims to be determined.) Visitors to the UK of specified ‘lowest-risk’ nationalities will be able to switch to skilled worker status without leaving the UK. Graduates of UK universities will be able to stay on after their studies to look for permanent skilled work – for six months for those with a first degree or a Masters, a year for PhDs. In addition to the highly skilled and qualified, business visitors will be welcomed, and the bureaucracy associated with getting visit visas reduced (although not the fees). No such welcome will be extended to low-skilled and unskilled workers, who are seen as bringing no benefit to the economy or (therefore) the country. To alleviate immediate labour shortages, the white paper proposes a transitional, time-limited scheme reminiscent of the German ‘Gastarbeiter’(‘guest worker’) system of the 1960s and ‘70s, for temporary, short-term workers. Workers of specified ‘low-risk’ nationalities and of any skill level will be permitted to work in the UK for up to twelve months, but must then leave for 12 months before returning. Such workers will have no right to bring family with them, or to switch to another visa, and will have no prospect of settlement in the UK. The scheme can be shut off at any time and will be fully reviewed in 2025. There is also the Youth Mobility scheme for ‘low-risk’ nationalities, allowing young people to work in the UK while having a holiday, which the government intends to expand. (As the working holidaymaker scheme, it used to be open to all young Commonwealth citizens under 27, who could spend up to two years here, until the government saw that too many black and brown Commonwealth citizens were using it, and restricted it to the white Commonwealth and east Asia.) In addition, the notorious seasonal agricultural workers scheme (SAWS), which admitted workers for up to six months to harvest crops under authorised gangmasters, with no rights to bring family or to stay on, is to be revived as a pilot. Otherwise, unskilled work will be performed by international students (part-time and in vacation), by British citizens, and by robots. The combined effect of the high skill/ low skill divide and the salary threshold will be to put an end to legal migration routes from the EU for care and construction workers, cleaners, hotel and catering staff and those in factory, food processing, warehousing and delivery work – who tend to come from eastern Europe – while retaining the bankers, IT analysts and consultants, engineers, medical professionals and lawyers who tend to come from northern and western Europe. It is of course the eastern Europeans, among them many Roma, who – as well as doing the hardest work – were subjected to constant vilification by politicians and the media in the years leading up to the referendum. Their only route under the white paper will be the one-year unskilled work visa, which forbids family reunion and requires one-year breaks between visas: a precarious, temporary, contingent status. The message, as throughout the white paper, is that they are foreigners now, and unless Britain can profit from them, they have no rights. Apart from the loss of free movement itself, it will be the end of EU rights to family reunion that is likely to cause the greatest hardship. EU free movement rules recognise the importance of families being able to be together, and provide that EU nationals working in a member state other than their own can be accompanied or joined, not only by their spouse or partner and the children of both partners (under 21, or older if dependent), but also elderly parents, grandparents and grandchildren, regardless of nationality, who are not even required to live under the same roof. Those arriving after Brexit will be subject instead to the extraordinarily restrictive UK rules on family unity, under which even the entry of spouse, partner and children under 18 is subject to strict criteria including income, language and dependency, while the entry of elderly parents has become well-nigh impossible. It is remarkable, though perhaps inevitable in an ever more nativist and racist polity, that British citizens with non-European family members may not freely bring them to live with them in the UK. It is tragic that the Conservative party, the self-styled party of the family, far from remedying this injustice by levelling up family unity rights to those of EEA nationals, instead opts to extend to EEA nationals the dismal lack of rights which has caused so much misery to British BAME citizens in the past. In this context, the white paper’s promise of a pilot project to give inmates of immigration detention centres the opportunity to Skype family members merely adds insult to injury. In the area of family unity, it is not only EEA nationals who will feel the pain. The white paper proposes a category of migrant worker – temporary, short-term, of any skill level – who are to be positively banned from bringing family members at all, even spouse or partner and minor children. 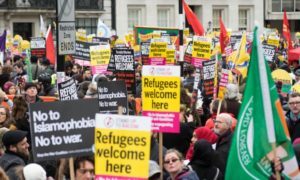 And the government rejects out of hand the proposal by campaigners for refugee rights that children recognised as refugees in the UK should be able to be joined by their parents and siblings. This cruel policy, justified by the government on the ground that such a right would encourage families to send their children on the dangerous journey to the UK alone, is not followed in other European countries, and in March 2018 a private member’s Bill to remedy it, the Refugee Family Reunion (No 2) Bill, passed its second reading – but the government has blocked the Bill’s further progress, and has now confirmed that, in defiance of the parliamentary vote, it will continue its obstruction. With the end of free movement rights for EEA nationals, they and their family members without a status in the UK (settled or ‘pre-settled’) or an application pending, will be subject to the same immigration rules as all other ‘foreigners’. They will need permission to come for work, study, to visit and to join family, and will be subject to the same strict provisions on overstaying and deportation. 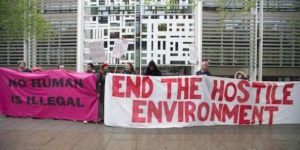 To retain their residence rights after Brexit, EEA nationals and their families living here will need to apply online under the EU settlement scheme for settled status, (or ‘pre-settled’ status for those with less than five years’ residence) by the end of the ‘grace period’ after implementation (June 2021, or 31 December 2020 in the event of a ‘no deal’ Brexit, according to the government website) – and there is no guarantee that applications will succeed, particularly if they come from people with a criminal record (however minor), or who are homeless or reliant on benefits. 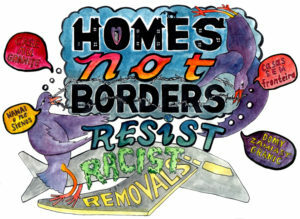 Those in the UK without evidence of settled or pre-settled status or of a timely application will, after the ‘grace period’, be vulnerable to detention and removal. 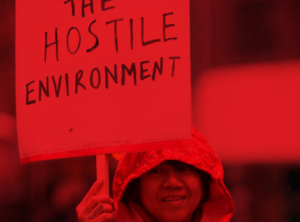 The white paper makes it clear that the hostile environment policies which have caused so much suffering will continue to be used against those with no demonstrable right to be in the country. There will be no mistakes, we are assured, no repeat of Windrush, because everything will be digitally recorded. Someone’s right to be here, or lack of it, will in this brave new e-world, be able to be evidenced accurately in the blink of an eye – literally (on entry), as e-passports will enable EEA citizens to join the British citizens and the ‘low-risk nationalities’ permitted to go through electronic passport controls. Integration of these digital records with those of other government agencies such as HMRC and the Department for Work and Pensions will enable immigration officials, and those the white paper calls their ‘delivery partners’, such as employers, landlords and educational institutions, to separate the legal sheep from the illegal goats ‘in real time’. Such blind faith in the infallibility of technology – and of people – appears quite terrifying. For just as in the Windrush scandal, there will be changes in people’s citizenship and residence status, and in the whole regulatory apparatus of control, years after their arrival, which take away rights they reasonably believed to be permanent – and not everyone will be aware of the need to register. In the 1970s and ‘80s, nobody in government thought to notify Commonwealth citizens individually that they needed to register as British once their countries became independent and they lost citizenship, or that they needed to retain evidence of their settled status. Similarly, there is nothing in the white paper, or in the bill to implement its proposals which is currently going through parliament, the Immigration and Social Security Coordination (EU Withdrawal) Bill, to suggest that long-resident EEA citizens and their families will be individually notified of their need to obtain settled status. Other government departments and agencies send out regular reminders to millions of people – notifying changes in pension rates or tax codes, reminding us to fill in tax returns, to renew TV licences, to pay road tax etc. In the white paper, the language of customer relations is deployed: the new immigration system will be ‘customer focused’, and will provide a ‘better customer journey’. Yet the Home Office, to which individuals pay hundreds, sometimes thousands of pounds in fees for visas, fails to provide the most basic ‘customer service’ of notifying individuals in good time of their need to obtain or renew permission to be in the country. Add to this the controversial exemption from data protection legislation giving immigration officials the right to deny migrants the right to see their immigration files (and therefore to correct errors, which according to the Chief Inspector of Borders and Immigration, occur in ten percent of cases), and all the ingredients for grievous miscarriages of justice are in place. Follow this link to read the white paper. The Immigration and Social Security Coordination (EU Withdrawal) Bill can be read here. Read Don Flynn’s Migrant Rights Network blog on the white paper here. See the website of the 3 million, a campaign group for the rights of EEA nationals resident in the UK, here. (1) The EEA comprises the 28 EU member states together with Norway, Iceland and Liechtenstein. Switzerland, not a member of the EEA, is part of the single market and Swiss nationals have free movement.